The St Thomas of Canterbury College student owners of StopCom, a company set up under the Young Enterprise Scheme, won both the Young Enterprise Scheme Company of the Year award and the Technology award this morning. They met with Minister of Economic Development and Canterbury MP, Jim Anderton, who offered his congratulations. "I congratulate these students on winning the Young Enterprise Scheme Company of the Year award, and also the Technology award. They have developed and marketed the CellTrac-r device for detecting cell phone use, especially useful in stopping cell phone cheating during exams. It is an impressive example of creative design and innovative technology, all the more so because it has been developed by a group of young students in their spare time. "Secondary schools are playing a key role in developing a culture of business enterprise and innovation. The abilities of young New Zealanders to turn good ideas into useful and saleable products will help lift our economic performance in the future, and is therefore something I happily encourage and support. StopCom was set up under the Young Enterprise Scheme (run by the Enterprise New Zealand Trust) where high school students learn about, set up and run their own company through the school year. 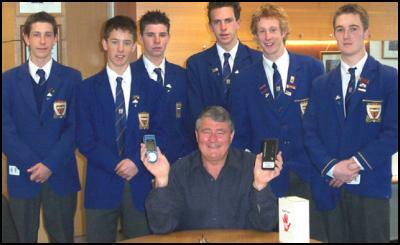 Photo attached of Mr Anderton holding up his own cellphone, which was tracked by the CellTrac-r device, which he holds in his other hand. Students from StopCom standing behind Mr Anderton include: Adam Manley, Managing/Communications Director; James Cole, Managing/Financial Director Logan Elliot, Secretarial Director Blair Renwick, Personnel Director Matthew Francis, Sales/Marketing Director Thomas Cole, Production Director. Find more from Progressive Party on InfoPages.